Facebook Page admins are publicly displayed only if admins have chosen to feature their profiles. However, there are some situations where you might want to contact a Facebook page admin or want to find out who is the owner of a Facebook page. Egyptian security researcher Mohamed A. Baset has discovered a severe information disclosure vulnerability in Facebook that could have allowed anyone to expose Facebook page administrator profiles, which is otherwise not supposed to be public information. Baset claimed to have discovered the vulnerability in less than 3 minutes without any kind of testing or proof of concepts, or any other type of time-consuming processes. In a blog post, Baset said he found the vulnerability, which he described as a "logical error," after receiving an invitation to like a particular Facebook page on which he had previously liked a post. Facebook has introduced a feature for page admins wherein they can send Facebook invitations to users asking them if they wished to like their page after liking a post, and a few days later, these interacted users may receive an email reminding them of the invitation. After Baset received one such email invite, he simply opened "show original" drop-down menu option in email. 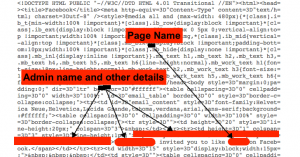 Looking at the email's source code, he noticed that it included the page administrator's name, admin ID and other details. The researcher then immediately reported the issue to the Facebook Security Team through its Bugcrowd bug bounty program. The company acknowledged the bug and awarded Baset $2,500 for his findings. Though Facebook has now patched this information disclosure issue, people who have already received one such page invitation can still find out admin details from the invitation emails. "We were able to verify that under some circumstances page invitations sent to non-friends would inadvertently reveal the name of the page admin which sent them," Facebook said. "We've address the root cause here, and future emails will not contain that information." Facebook has now patched this information disclosure issue.